All the usual chat from the Supercross weekend, plus some fresh accents from the MXGP crowd. 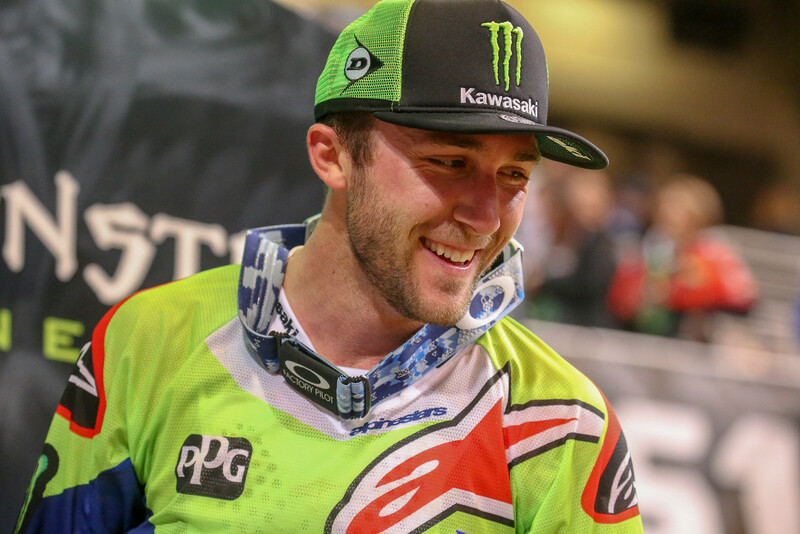 "There are days where you just feel like you're on and I was on all day," said Tomac. "This is the best dirt in the series and I just had fun riding my dirt bike tonight. We work hard all year to find a good setup for my KX 450F and I think we showed tonight how that work is paying off." "I'm good with second," said Anderson. "My heat race was a little rocky, but I made it up in the Main Event. I'm glad I was able to extend my points lead and I'm looking forward to next week." "I'm a little bit disappointed with the performance tonight, I finished pretty far off the leaders. Riding by myself the whole Main Event was not easy but I gave my best the whole time. I still got a 3rd place on the podium but I wish I could have battled more with the 2nd place. I thought the riding was okay but I was just missing a little bit of rhythm." "St. Louis went much better for me than the week before in Daytona, where I dealt with sickness and the crash in Atlanta. I rode well in practice. I came from 10th to 5th in the heat race. In the main event I wanted to be safe and stay on the inside, so I chose a gate that had a big pot hole in front of it. I didn't get the best drive, but I made some good passes and fought my way up. I held strong through the main event and ended the night in fifth. I felt strong and am back in the right direction to where I was in the early part of the series." "Before the night show we stiffened up the suspension, because there were some deep ruts. That worked in my favor. As for the quad jump, I didn't think anyone would do it. Then Malcolm did it, so that encouraged me to go for it. It was an easy jump. I just had to make sure I gave it enough gas to get over it. The rhythm three-three-three jump section before the finish line was more difficult than the quad." "Today started off decent, but I struggled a lot with the track. I was pretty frustrated throughout the day, so just reset for the heat race, where I finished fourth, which was okay. I went into the main and was focused on trying to have fun but I just couldn't get a flow. I was just riding around—couldn't push and didn't have any intensity. Overall I was a little off today and it was frustrating, especially after two really good weekends. I wanted to keep the ball rolling, but a ninth place isn't the best. It's also not the worst though, so I'll just learn from this and regroup for next weekend." "I was riding well all day long. Unfortunately, I had a bad jump off the gate in the heat race and came together with another rider. I crashed and messed up my shoulder. I ended up with 10th in the main event. I can't complain. I'm just glad that I'm safe. Later in the week I should have an update on my shoulder. Thanks to the fans for being there for me, as well as the medical group for helping me out!" "Overall I would say it was a positive weekend from the last couple I've had. It's definitely a step in the right direction. I had two good starts and I put myself in a good place to get good results. I felt like I was just a little off speed-wise today on the track but all-in-all it was a positive weekend." "This was another positive good day," said Wilson. "I was close to winning my heat race so that was good. I've been working hard on my starts. I was 11th in the main and got up to 8th. I'm going to get back to work on Monday and will try to improve." "We felt really good in qualifying today and hoped that would transfer to the night show," said Bowers. "Unfortunately, I got behind the pack in the main and wasn't able to catch up, but I'm hoping to come back strong next week and fight for that win." "I'm satisfied with my 450 results, I've been close to the Top 10 but this week was a bit off the pace ," Chisholm said after the race. "My plan all along was to keep the ball rolling from the 250 season and use this time to continue my training program and keep my body on race shape. We definitely did that and being at the races is still as fun as it's ever been. Today was difficult, I felt just a bit off the pace in every session and I feel like I should've been higher up on the board at the end. I'm excited to get back on the YZ250F and finishing out the season strong back on the west coast." "We brought the A-Team to St. Louis this weekend!" said an excited Enticknap. "It was awesome having Tyler helping me out. I know he wants to get back to racing soon but if we keep making mains when he's spinning the wrenches, I might just have him wrench for me full-time!" "Big win tonight in St. Louis," said Osborne. "I feel good about the way I rode. I came out with some good speed in practice and found my feet today. I was able to get a gap in the end and managed the race from the front. It's an incredible feeling when you can do that. I'm happy to leave St. Louis with a little gap in the points. I'm just going to keep working." "Yeah, we're here fighting for it," said Martin. "These guys are good. I felt really good in practice and I was fifth fastest. I felt like I was giving her the beans, and these guys were still faster than me. I just put my head down, and every time I go out there I just try to fight the boys. "I can't control these guys or what they're doing or what they're thinking," continued Martin, who is now up to fourth in the standings, 22 behind Osborne, the leader. "All I can do is focus on me and what's going on. Zach and Forkner got away a little bit there. I was like, we're settling in for the long haul. That's what we did. We just kept fighting. I just did the best I could do." "It should be wild," Martin said of the battle coming this Saturday. "Look at the east coast guys. We've been KO'ing ourselves it seems like just in our series. Get the west coast guys in there and get a little different flavor. It should be a good night of racing." "I got off to a pretty good start and was able to salvage what I could from an outside start," said Smith. "When I got into third, I settled in a little more than I think I should have and wish I would have pushed a little more to see if I could have challenged for second. I am happy with my result though and it's put me in position to see the top two guys in the points. There is still a lot of racing left and we'll see how the showdown comes into play next week." "Overall, it was a great weekend. I made a lot of improvements in bringing a typical practice day to a race day situation. I qualified well and my times were close. Heading into the night show Buddy Antunez helped me with a few things, which really helped. I holeshot my heat race, which was great, but I rode a little tight and finished second. I worked hard in the main event and came away with fourth. My riding was so much better than it has been. I'm riding more like myself. It was a confidence booster to get that monkey off my back." "The quad was possibly the biggest jump I've ever hit on a Supercross track. Stewart was the first guy to do it. Jeremy Albrecht and Buddy told me that there were going to be 250 guys doing it, and that I should go for it. I sized it up a few times, but I never even hit it until the heat race. That was the first time I sent it. The transition got a little choppy in the main event. Halfway through the race I did it, and there was a rider down on the landing. I landed just as a track worker was picking up the rider's bike and I clipped his handlebars. That was a scary moment!" "It was a frustrating night for sure, but it's one thing to dwell on what could have been and another to turn our focus to a great opportunity next weekend with the showdown," said Forkner. "I made mistakes and then I also was involved in mistakes not my own doing, but everyone has their bad days and I'm hoping this is the worst I will encounter as we keep pushing forward toward the end goal." "St. Louis was good," said Mosiman. "I had a good day in practice. My starts were good all day. I had a little trouble in the heat race but was able to get back into qualifying position by the end. 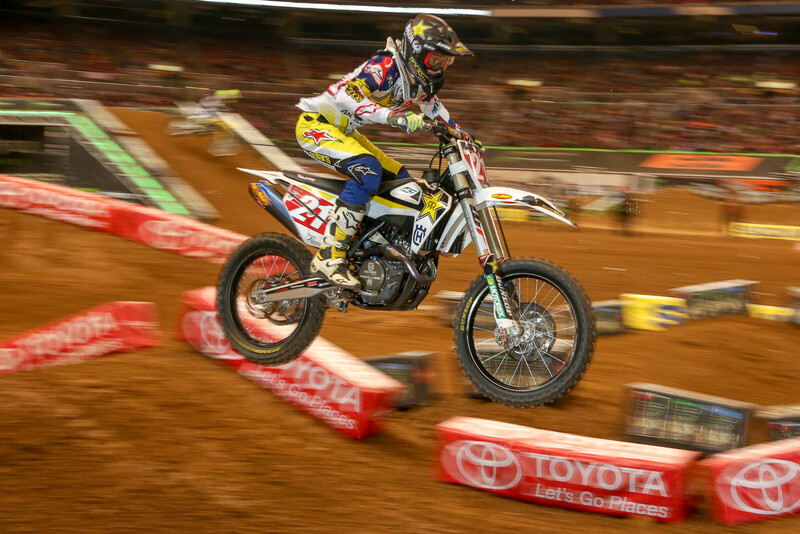 I had another good start in the main and I'm so happy to get my first top ten in Supercross. I'm excited to head to Indianapolis and race with all the West Coast guys in the Shootout." "It's really tough to know you have an uphill battle from the very start of the race, but all I could do is try and pick off as many riders as I possibly could," said Cantrell. "Working hard to push forward paid off and I was able to get inside the top 10. I've been able to get a couple of top 10 finishes and would really like to break into the top five. Next week will be my first showdown race so we'll see what I can do with the different format." 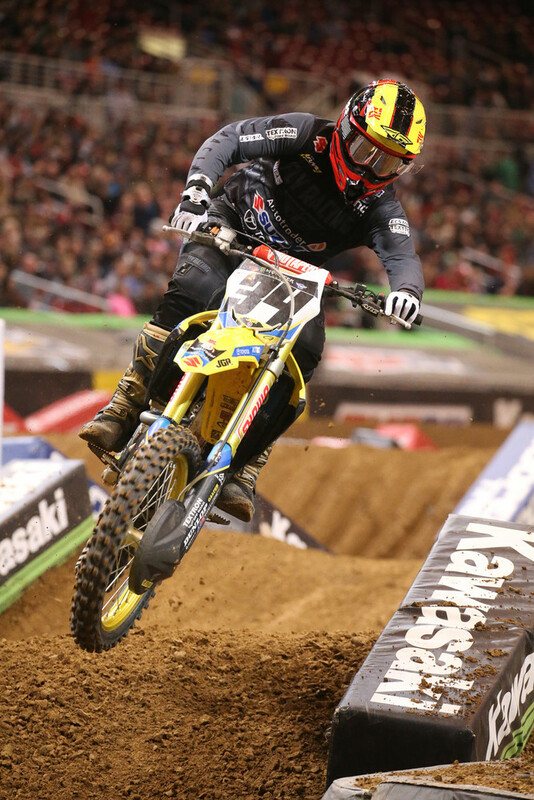 "The Autotrader/Yoshimura/Suzuki Factory Racing Team had a solid weekend. Stewart rode super well. I thought he had podium speed. It was the best I've seen him ride this year. He finished tenth after not knowing whether he could even ride the main event, which shows his determination. Peick was back to where he was earlier in the year, which was great. Peters had a holeshot in his heat race, which is the result of him practicing starts this past week. He's getting better every week. 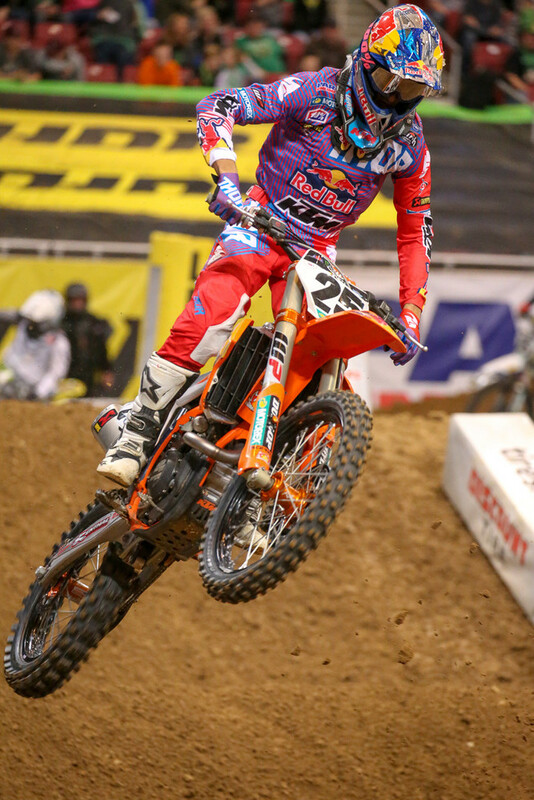 Everyone feels like they can get better, which is a great sign at this point in the Supercross series." "I'm excited to see Justin Hill back on the Suzuki RM-Z250 this weekend in Indianapolis, as well as Peters coming off his best race and Phil Nicoletti finally feeling healthy. It should be interesting. You can make or lose a lot of points. We'll know more about Stewart's condition later in the week, as well as an update on Jimmy Decotis' injury from Daytona." "I thought today was a learning experience for Christian. He's still adapting to the 450 class and bike, so he's coming away from here learning a few more things. We'll take it into next week and apply it. I think he did well overall though. It just was a tough track for him and he never really found his groove or sync with it. A solid top 10 finish in this class is good, and we're out of here safe, which is the most important." "Bike-wise, we only made small changes throughout the day. Christian was bottoming a little bit, so we made the fork a bit stiffer and changed a click or two in the shock, but overall he was happy with the bike. He just struggled with a section on the track that he didn't feel confident to do, so I think that really started his day in the wrong tone. Throughout the day, he didn't have the spark we've seen the last couple weeks, but he still got top 10, which is a good finish for him." "I'm super-happy. We worked hard for this and it seems like we are getting better every week. I want to thank the team and everybody around us who has been pushing so hard. To get results like this is amazing. I've been riding at Red Sands a lot and the guys there did a great job with the track. I hope we'll find some kinder temperatures next weekend!" "A very good race again and we managed to make it to the podium. That's the goal: to always be top three. I knew Jeffrey would be very strong here at his home GP and that I'd struggled in Valkenswaard for the last few years. I made some mistakes and we need to work on those and figure out why I am crashing but at least we saved the result today and made the podium. I want to be strong and healthy each weekend and again we showed we have a different speed from the rest. The aim is to try and win the next one and have fun again." "It's been a good weekend of racing and I'm happy for our first podium result of the season. I had a good start in the opening moto and after a good first lap I found myself close to the leading group of riders. There were many ruts in the track and it was difficult to pass. Just before the end I had a small crash in a frozen rut but I got back quickly and finished seventh. My performance in moto two was better and I got third at the line for third overall. I'm quite happy I managed to turn things around and this is really positive for the races to come. My bike has been working awesome throughout the weekend and I feel really confident on it. We now need to keep the hard work going and hope for the best in the next GPs." "It was a great weekend and I felt very good on both days. I had two starts and rode solid both times. I was a little tight in the first one because I wanted to follow those guys [Cairoli and Herlings] and I wasn't smooth. I had to slow down a little bit. It was very tough because there were a few guys behind me. I pulled another good start in the secod moto and I could see Tony was going way-faster! I tried to follow Jeffrey as well but quickly understood those two were a level above everyone else. Anyway, same points as the third place guy and it is such a shame not to be on the podium here because I have never made it at Valkenswaard. I'm going home a little disappointed but knowing that I rode well and being up there was good for my confidence." "I had a good feeling overall this weekend and if it wasn't for a few small mistakes I could have gotten even higher in the overall. In the opening moto my start was ok, but I managed to come through. Making a lot of passes I crossed the line in fourth and this made me want to do even better in moto two. I had a better start in the second race but a mistake on the opening lap dropped me outside the top 10. I put my head down and managed to get inside the top six, but a small crash in the final lap meant I had to settle for ninth. We had our ups and downs this weekend but the speed was good and I'm looking forward to racing in Spain next weekend." "I knew when I came here that it would be a tough weekend with such low temperatures; it was so cold that we had no fun riding our bikes. We had never tested in these conditions but we improved my feeling with the bike throughout the weekend. I'm happy that this weekend is over as I have some bad memories here. The start was really fast, it was difficult to pass and we saw that some guys crashed pretty hard. Eighth and seventh meant that I was not in the leading group this weekend but I scored some important points today and we know that it will be a long season." "Actually I am a little bit disappointed because yesterday I had good speed and the qualification race went well, so I was expecting a bit more from today. I had two good starts but made quite a few mistakes that cost me a lot of time but I'm happy that finished both races – and that I didn't get hurt. We did some important laps, so now I'm looking forward to Spain." "So far we've been struggling a little bit with setting up the bike but last week we made some good progress which is what I've needed after missing all winter. Even in free practice when I was second overall I felt good and I wanted to push onwards but as we made some changes to try and improve I made mistakes and crashed quite hard in the qualification race. Today I had a bit of pain all over, so I decided to back it down and overall it seemed to work out. We're getting better and my 11th in the second moto after 13th in the first race shows that improvements are there. The team have been working hard and I'm looking forward to continuing this level next weekend in Spain." "It's nice to start defending the title with 1-1 in the two first GPs and I so happy with the results so far. Today wasn't so easy because I was a bit sick after Argentina. I was a bit stiff and not so aggressive as usual. Anyway, we have one week now to get ready for Spain. I hope it is warmer there because here was so cold! I was happy to see a lot of Latvian flags out there!" "The first GP was not the best so I'm happy I could get on the podium here; especially last year when I messed it up. I'm really glad to take second place and to be fighting for first place both times with Pauls. In Argentina I could not really feel my strength and all my work in the winter but today I felt better than ever and was very consistent. Pauls is riding really well and the other guys are far behind so this means we are riding good. I'm happy. Now for the home GP." "It was a good weekend despite tough conditions. Weather conditions were extreme for all and the low temperatures during the whole weekend didn't help at all. To be honest I struggled to get a good pace in the soft sand and wasn't feeling great going into Sunday's racing. Ending up with a pair of third place results in these conditions is super positive. I want to pick up my pace now going into Red Sand in Spain. I am confident with the progress made so far and I think we can keep improving in every moto and every GP." "It's been a positive weekend. To be honest I struggled to get a decent pace two weeks ago in Argentina so my overall performance here in The Netherlands is a good confidence booster. Following my win in Qualifying I got two solid motos and ended up getting fifth overall in the class. I am happy with the progress made during the last couple of weeks. The plan is to keep working and keep putting the same amount of effort, hoping for improved results in the races to come." "It was a so-so weekend really, from my perspective. We got sixth from the qualification race but in the first moto I didn't get a good start after being too aggressive with the clutch. I was around 16th to begin with but I was making passes and moving through the pack. Then I had a coming-together with another rider and dropped back down again. I pushed through to get sixth in the end and although I was disappointed to have only come sixth, I was happy with my riding and that I got close to the money points. In the second moto I got a really good jump out the gate, but I just couldn't make it stick around the first bend. I just couldn't get into my groove though and was struggling most of the moto. I gave it everything I had but I didn't have anything for the guys up front this weekend. Next week is another round though and I'll be giving it my all once again." "In the first race my start was pretty good but I hit a rider who crashed in front of me and then on the same lap I crashed again. I was a long way behind but I recovered to sixteenth, even if I was a little tired at the end. In the second race I was around twelfth at the start and came back to eighth; for sure we want more but we are progressing each week. The weather made the track difficult and conditions were different each time we went on the track." "The whole weekend hasn't gone the way I wanted. I was expecting a lot more from myself, so disappointed is an understatement, actually. I know I'm a lot better than what I showed today, and I'll keep it in my head. I didn't have the best feeling with the bike during warm up, but we made some adjustments ahead of race one and I felt a lot better. Unfortunately I put it down – my fault – so I finished 15th. In the second race I got a better start but the guys were catching me from behind, and then a coming together cost me a few places. We need to step up our game in Spain because I didn't have the right pace here in Holland. I also did not have the intensity needed for this type of track: the flu might have played a part, but no excuses." "This is a race that'll never forget with the blizzard and track conditions! For some reason I feel that my hands are more sensitive to the cold than others. On Saturday my hands completely locked up and I can't use anything, I just went on a four finger deadlock on the bike. That makes it hard to focus on your riding! Overall we could've done more this weekend although the second moto was actually a little better. We need to improve both my starts and qualifying. Qualifying is something that I've struggled with last year as well. Once I've started to figure that out things started to improve. So hopefully we can make that happen again." "It was a positive weekend for Arminas Jasikonis, Petar Petrov and Marshal Weltin with them scoring their best results of the season so far in what were very difficult conditions. Hunter Lawrence also performed very well but couldn't quite battle it out with the top guys, however he is still third in the MX2 points which is a fantastic achievement." "It was really unfortunate for Bas Vaessen to suffer an injury at his home GP, especially after he performed so well in qualifying with a 10th place finish. The same for Micha Boy de Waal, who was kicking off his championship and had good times in free practice. He then crashed into a rider in timed practice but hopes to back for Arco di Trento which is round five." "It was of course great to see Tim Gajser back in action here this weekend. His results were a good starting point for the season and I'm sure he'll work his way up to the front of the field in the next few rounds. Calvin Vlaanderen was unfortunate with a couple of incidents but knows he'll have better weekends." After what he's been through lately in terms of injury and recovery, we can be quite happy with Tim's performance and results for this weekend. He was fast but lacked a bit of consistency, and he ended up making some mistakes which fortunately left him unhurt. The season has just started for him, so it'll be important to build some momentum in the upcoming races. The Honda CRF450RW worked really well throughout the weekend so a thank you goes to all the team members for the great job.